Winner of the Berliner International Music Competition, the Prix Jeune Soliste des Médias Francophones Publics, and the International Manhattan Music Competition, young cellist Christoph Croisé debuts on AVIE performing the two Cello Concertos by Franz Joseph Haydn. His fresh and fervent approach is matched by his collaborators, the Eurasian Soloists Chamber Orchestra, as they recreate the original set up of the works’ first performances in the Esterhazy Castle when the composer directed from the harpsichord alongside the first violinist and the soloist. 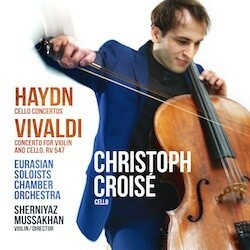 Christoph concludes the album with Antonio Vivaldi’s Concerto for Violin and Cello, RV 547, joined by the orchestra’s founder and director, Kazakh violinist Sherniyaz Mussakhan.